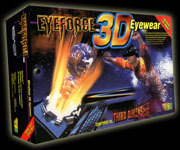 The Eyeforce™ Pak is the newest and most exciting gaming experience for the PC. The 3D eyewear is a lightweight high quality imaging system. Combined with a powerful graphics accelerator card, it transforms just about any computer games into an unbelievable and fascinating experience. View exclusive stereo 3D video of the making of the Sports Illustrated swimsuit issue. Featuring Heidi Klum, Kylie Bax and Shakira Ledard! This multi-media PC CDrom Includes movies and Stills. Another exciting Razor Digital Media Stereo 3D CDrom title based on the wonderful collection of Photos published by Mark Blum. Contains 44 stunning images of life under the Sea from a variety of locations. You can play 100's of Direct X or Glide games ! H3D driver - Initialises the page-flipping and interlaced modes as the latest NVidia 30.82 drivers do not do so on their own.